This compilation of Mike Pilavachi's four Soul Survivor Life booklets provides a whistle-stop tour through birth, adolescence, mid-life crisis and death. Essential biblical teaching to challenge and inspire you - no matter your age! 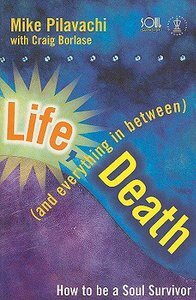 About "Life, Death (And Everything In Between)"
This volume charts the spiritual life journey we all follow from our birth into new life as Christians, maturing into the long trousers of faith, coping with crises of faith and what happens to us physically and spiritually when we die. This is a compilation of Mike Pilavachi's four short Life series books-- "Walking With a Stranger, My First Trousers, Weeping Before an Empty Tomb," and "Afterlife." Written specifically for the younger Christian generation, the books chart the spiritual life journey all Christians follow-- "birth" into new life as a Christian, maturing in faith, coping with crises of faith, and what happens physically and spiritually upon death. Liza Hoeksma is a writer who has been involved with Soul Survivor for over ten years. She has co-authored several books including Conspiracy of the Insignificant with Patrick Regan, and Worship Evangelism Justice with Mike Pilavachi.